As a product of an inter-racial relationship (what a clinical term!) myself, I was disturbed that colour was the manner in which Canada’s national news network chose to describe the latest census results. I remember far too easily the painful playground taunts of “banana, banana” because I was “yellow” on the outside and “white” on the outside. Colour, as a means of describing people, is shorthand for all kinds of discriminatory attitudes. At the beginning of the twentieth century the term “yellow peril” was used to attribute a wide variety of dangers to migration from Asia including loose morals that would corrupt society and cheap labour that would take away jobs from hard-working Canadians and Americans. The subtext was that Anglo-Saxon societies everywhere were going to be harmed by yellow hordes. Such imagery quickly captured the imaginations of editorial writers, filmmakers and the North American public at large, who used it to conjure up images of Attila Hun and masses of threatening, raging, invading Mongols. 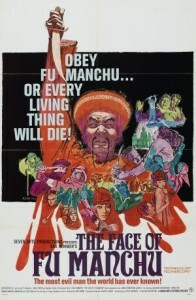 Fu Manchu, a fictional character, created by Sax Rohmer, came to embody the archetypal Chinese threat, with his evil laugh and sinister moustache. This imagery of difference had major repercussions as it reinforced beliefs about the impossibility of assimilating Chinese migrants into North American society and contributed to the imposition of head tax legislation and outright exclusion from Canada in 1923. The CBC’s casual references to colour as a way of earmarking ethnicity ignore the long legacy of racism and discrimination that such usage encapsulates and perpetuates. With a little lesson in the geneaology of colour-coded racism, the CBC might have chosen a more appropriate term to describe the many celebrations of love that have been taking place in Canada. It is people who are getting married after all, not colours. Laura Madokoro is a PhD candidate in history at the University of British Columbia. She studies twentieth century global migration with a special focus on political refugees in Asia and the Commonwealth in the post-1945 period. I’m a bit confused by this. Do you simply object to the CBC’s use of the word “colour” to denote race? Are you objecting to the census’s use of race as a category? Are you objecting to the idea that we should continue to notice and describe racial differences between people? “Colour” (well race, really, which I understand the CBC title is referring to) is also used as a means of describing/categorizing people for affirmative action purposes. It is not, as you sort of suggest, only something that is used to denigrate and disempower people. I haven’t listened to the CBC radio program, but from skimming the article you linked to I can’t really see a link between early 20th century racism and the central message being communicated. i.e. that interracial marriage is an indicator that cultural and racial differences/misunderstanding/racism and so on are declining in Canada. All of which is up for debate, of course, but I just don’t see the malice. I really enjoyed reading this. It made me think about how fitting people into racialized categories can and has been denigrating, disempowering, and dehumanizing, past and present. It made me think about how we do and/or should wield terms like “colour,” and importantly, the effect they can have on people, inadvertently or not. Terms like these have deep, and all too often oppressive, historical roots, the impact of which is still felt today – hence the need for things like affirmative action programs. The Census itself is a massive field for historical inquiry and debate, and certainly not an easy topic to fit into 400 to 600 words! Thank you very much for this thoughtful contribution, Laura. Great comments! I am enjoying this discussion. Thanks for your call to clarify! Yes, in a nutshell, I find it objectionable to use colour to describe people – even in the most lighthearted of ways. As you point out, on the surface it seems rather harmless but there is a nasty history of using colour as shorthand to mark out difference or promote blatant discrimination. So even if the CBC was using “colour” in an innocent way in 2010, that’s not how it was used a century ago. I guess you could look at it two ways. By being so casual about it, the CBC’s news headline might be an example of really enlightened thinking, where labels don’t matter anymore. Or (and this is where I sit), the CBC has forgotten, or is ignoring, the effect that terms such as “yellow peril” had in the past. @ Christine, I think the census is definitely something we should be thinking more about – especially how it has changed over the years. It’s one thing to create questions that people have to answer, or categories that they have to fit into, and a completely different thing to understand what people are thinking as they check a box, or fill in a blank. Have you read Household Counts: Canadian Households and Families in 1901 (Toronto: University of Toronto Press, 2007)? It is edited by Eric W. Sager and Peter Baskerville and includes an essay by Dr. Chad Gaffield about census categories. It’s on my very long list of books to get to. Thanks for the reading suggestion! Bruce Curtis has also written a great book on the politics of census-taking in Canada, called The Politics of Population. The census could certainly be the topic of a number of posts. That being said, I very much enjoyed this post. Many of us would do well to consider our words more carefully, and to remember that words can indeed hurt. Looking forward to your future contributions! Thanks for the response. I was thinking about the issue of using colour to describe someone after I posted my comment. I frequently use colour to identify people. For instance, calling an African American or African Canadian or Caribbean person black, or an Indian person brown…white people white, etc.. But I would never refer to a Chinese or Japanese or Korean (or any Asian) person as yellow. The reason being that it is clearly an offensive term, given my knowledge of its history. I would always refer to the person as either Asian or from their ethnic/national origin – if I knew it. I would also never refer to an Aboriginal person as red for the same reasons. But it’s not like there haven’t been any negative/derogatory terms associated with the colour signifiers black or brown. So then I was wondering why it isn’t considered offensive to use those terms? And, using the phrase People of Colour is quite common in academic writing. I can see all sorts of problems with this: the most obvious being that it suggests “white” people are unmarked or colourless or neutral. So, again, I was wondering, why is it ok? Or, is there a debate I’m not familiar with? Probably. I’m not sure what my overall point is. Basically, it’s complicated. My initial reaction to your piece was that it is impractical to suggest that we cease to discuss colour and race because of racism in the past. I think not discussing race, in particular, is quite dangerous, given that we continue to live in a society where power continues to be concentrated in the hands of white (Anglo/Western/ Euro) folk. And, when you’re discussing race, the issue of colour or other signifiers of difference are never far behind.